Crowns and bridges are used to restore teeth that are damaged, or replace a missing tooth or teeth. A crown, also known as a cap, is used to cover the entire damaged tooth. A crown can not only strengthen a tooth, but it can be used to improve a tooth’s appearance, shape and alignment. 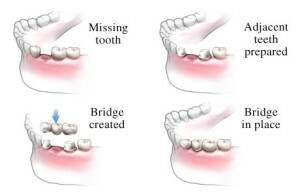 A bridge is sometimes recommended to fill the space created by missing teeth. A bridge provides one or more artificial teeth that are cemented into place using the teeth on either side for support. This is an option for filling the space created by a missing tooth. 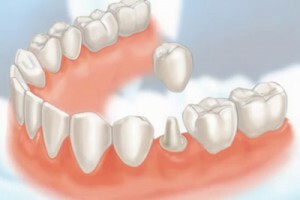 A bridge replaces the missing tooth, both functionally and cosmetically. The materials used may be gold alloys, porcelain bonded to metal alloy, or all ceramic material made to match your natural tooth color. The choice of material depends on requirements for strength, wear, and/or esthetics. A filling is used to restore a tooth damaged by decay or fracture back to its normal function and shape. First, the dentist will remove the decayed tooth material, clean the affected area, and then fill the cleaned out cavity with a filling material. A filling also helps prevent further decay by closing off any cracks or spaces where bacteria can enter. There are a variety of filling materials available including gold, silver, plastic and porcelain. The dentist will work with you to determine which material is best for you, depending on the extent of repair, where in your mouth the filling is needed, and cost. A majority of the time in our office, a tooth-colored filling called a “composite resin” is recommended and used. These fillings are matched to the color of your teeth and blended to look as natural as possible. These may not always be appropriate for large areas or when substantial tooth structure is missing, and your dentist will always discuss this with you. A dental implant is an ideal tooth restoration for people who are missing one or more teeth as a result of injury, periodontal disease, or any other reason. A dental implant is a biocompatible metal post that is surgically positioned into the bone. Once in place and bone surrounding the implant has had time to heal, a replacement tooth is attached to the post. In many instances, implants provide superior benefits over other methods of tooth replacement. Implants are very strong and resistant to breaking. They are also a more favorable approach in many cases than bridgework since they do not depend on neighboring teeth for support and are easier to keep clean. Implants are also permanently cemented so there is no appliance you must take out every night. Implant-retained dentures are a great option when tooth loss has occurred and caused severe bone loss, therefore leaving no ridge/bone to support the denture. When there is not adequate bone to support the denture, it may not fit as tightly. This can affect your speech, chewing ability, and overall quality of life. Implants can often be placed into the bone, and a removable denture is then made to lock onto the implants and make for a better and more secure fit. A denture is a removable replacement for missing teeth and their surrounding tissues. There are two types of dentures available, a partial and complete dentures. Dentures are made to resemble your natural teeth so there should be no noticeable change to your appearance. In fact, dentures may even improve your smile! Complete Dentures – This restoration method is used to restore your smile and mouth function if all your teeth have been lost. The dentures are custom created to resemble natural teeth and are positioned into a patients mouth to take the place of where the natural teeth used to be. Partial Dentures – A removable partial denture is a device used when one or more natural teeth still remain in the upper or lower jaw. They usually consist of replacement teeth attached to a gum-colored plastic base which is held in place in the mouth. Root canal therapy is necessary for many reasons. Often it is when a deep cavity reaches all the way to the pulp, the nerve of the tooth. Sometimes deep restorations or trauma to a tooth may cause the nerve to be damaged to the point it needs root canal therapy. Once this occurs the pulp becomes infected, and can even extend through the root tip and begin to eat away at the surrounding bone (this is an abscess). By the time the pulp is infected it must be treated, and cannot heal on its own. Symptoms that the pulp has become infected may include sensitivity to hot/cold or sweets, pain, swelling, throbbing, pain to biting or pressure, and a bad taste in the mouth. Sometimes, however, no symptoms are apparent and the patient is unaware of any problem until a checkup with x-rays. The root canal procedure is started by cleaning out the infected tooth pulp, and disinfecting the canals of the tooth. Once the infection is resolved, the canal(s) are filled in to prevent any further infection. Once the nerve is removed, the tooth becomes more brittle and prone to fracture. Therefore, a core build-up and crown is recommended for restoring a tooth that has had root canal therapy. Please get immediate dental attention, as some procedures, require treatment within the first hour for best results. Bonding involves adhering composite resin material that is carefully matched to the color of the tooth and then applied to the surface of the tooth. This procedure is performed to repair damage done to the tooth by decay, or fractures, close gaps between the teeth, or for other cosmetic purposes. First the surface of the tooth is roughened in order to accept the bonding and hold it. Next, a gel is applied to help the bonding material penetrate the tooth surface, and a primer/bond agent is applied so the material adheres to the surface. The composite resin material itself is then placed on the tooth and hardened with a UV curing light. Finally, the bonding is shaped and polished to give the tooth a natural and luminous appearance. Veneers are a dental procedure in which a covering is placed over the outside (visible area) of the tooth. They are usually only done to the part of the teeth that are visible when talking or smiling. At least two appointments are needed because the veneers will be fabricated at a dental laboratory. At the first appointment the teeth are prepared, impressions taken, and the teeth are given a temporary covering. When the veneers are back from the laboratory, the temporaries are removed and the veneers are bonded to the teeth. The laboratory fabricated veneers are usually made using porcelain or pressed ceramic, and these materials will look natural and are very esthetic. The advantage of veneers versus crowns is that much less tooth material is removed. Veneers may be recommended for teeth that have small fillings or small amounts of missing tooth structure if there is enough strong and stable tooth to support the veneer. Tooth whitening is a popular procedure to make teeth whiter and brighter, and therefore more attractive. Bleaching can be used to whiten stained and discolored teeth, or simply to enhance a dull smile. Either way, tooth whitening is a safe and relatively painless procedure ideal for most patients. Our office primarily offers and suggests take-home trays for whitening. This method has been shown to have the least chance of causing sensitivity and also provide the best long-term whitening results. Tray whitening is a whitening treatment you can use while in the comfort of your own home to gradually whiten teeth. We will first take an impression of your teeth to create a customized clear tray that you will wear to whiten your teeth. Within 1-2 days your trays will be ready to be picked up and we will show you how to apply the bleaching material to the trays. The trays are worn at home for approximately 10-14 days. Occasional touch up treatment can be used at your convenience to maintain your new smile. A prophylaxis, also called a dental cleaning, is a professional cleaning you receive from one of our registered dental hygienists. Cleanings should be performed at least every six months to prevent excessive plaque buildup and calculus, often referred to as tarter. Plaque and calculus left untreated can lead to unhealthy gums and tooth decay. At this appointment, you will receive an updated medical history, needed radiographs/x-rays, periodontal evaluation, a dental prophylaxis, doctor’s exam and oral cancer exam. We will also offer oral hygiene instruction and answering any questions concerning you and your mouth. The gums, ligaments, and bone around the teeth form the foundation for one’s teeth. All structures are also referred to as the periodontium. When the periodontium is not healthy, it jeopardizes the teeth just as a bad foundation would threaten the stability of a house. Signs of unhealthy periodontium include: gums that are red and bleed easily, persistent bad breath, gums that are pulled away from the tooth, loose teeth, and changes in the position or bite of the teeth. Any of these may be a sign of a problem. With proper gum treatments, however, it may be possible to return gum tissue to a healthy state. If you’re having a problem, come in and see us so we may treat it right away. The treatment usually involves a deep cleaning or root planing done under a local anesthetic, along with local antibiotic agents. Sometimes depending on the severity, we will refer you to a periodontist, a dentist who specializes in the treatment of gum tissues. Periodontal disease is one of the major causes of tooth loss in adults. The Georgia Dental Association recommends seeing a patient as early as 1 year old. It starts with a visit to help answer any questions that the parent/parents may have. Our goal is to start developing a comfortable and lifelong dental home for our youngest of patients. Usually, the actual prophylaxis/dental cleaning is not usually performed until approximately age 3. Routine Checkups/Exams can include some, but not all of these, based on the patient’s age and needs. Sealants are used to fill in narrow grooves in a tooth that cannot be adequately cleaned by brushing. In some cases, the tooth structure has fine grooves or pits which accumulate plaque, not because the person doesn’t brush, but because of the way that the teeth were formed. These areas are more susceptible to develop cavities over time. Sealants are pain free and require no anesthesia for the patient. 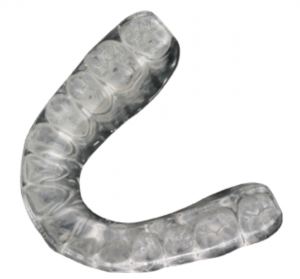 Custom designed mouthguards and nightguards are made of flexible plastic and molded to fit the shape of your teeth. Mouthguards are recommended to protect the jaw and teeth during physical activity and sports such as boxing, football, basketball, or other activities where your mouth may get hit. In addition, these guards protect the soft tissues of your tongue, lips and cheek lining. Nightguards are also recommended for patients who clench or grind their teeth at night as a way to protect their teeth and bite. They are used to help with TMJ and excessive wearing of the teeth. Unlike the over the counter nightguards, our nightguards are custom made to work with your opposing teeth to help reduce the causes of grinding and clenching, not just fracturing of the teeth. If you have decided a guard is right for you, the dentist will take an impression of your teeth which will then be sent to a lab to make a custom fit guard for you. Typically, middle-aged and older people who are overweight are more likely to be sleep apnea sufferers. Although men and women of any age or body type can suffer from this condition. Sleep apnea may progressively worsen with age and weight gain. If you’ve been diagnosed with sleep apnea, a customized and comfortably fitting oral appliance can help keep your airway open during sleep. This appliance positions your lower jaw slightly forward and down. As a result, your airway stays open; you’ll stop snoring and you’ll get an uninterrupted good night’s rest. With people living longer, keeping our elderly patients comfortable is our top priority. By helping to keep the mouth healthy, we hope to be able to sustain our patient’s quality of life. If the mouth is unhealthy so is the rest of the body. Having dental pain can lead to difficulty eating, speaking, and sleeping. There is a link between diabetes and gum disease, studies have shown that high levels of plaque and calculus can lead to an increase in pneumonia. With so many different medications, their side effects often including dry mouth, the elderly population is more prone to root surface decay. The lack of saliva decreases the mouth’s natural cleansing ability, often leading to food impactions and difficulty cleaning. We believe in treating our geriatric community with the best of care, while being conservative to all of their needs, whether financial, health or time. In order to provide nothing but the best to our patients, our office uses state-of-the-art technologies in all our procedures. These new technologies allow us to detect dental concerns at early stages, treat your dental issues with precision, and provide excellent, customized restorations. Our premium dental software system maximizes your time and our office efficiency. When you visit our office you can be confident that you are receiving the finest and most advanced in dental care. With this advanced technology we can zoom in on small diseased areas, cracks, chips and worn fillings with extreme precision. 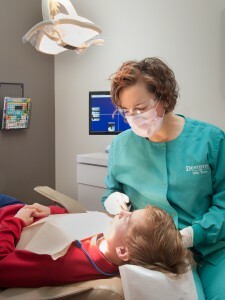 The full-color images taken with the intraoral camera can be viewed on our computer screen so we can clearly see and diagnose dental problems much earlier than with traditional dental technology. Because images are displayed on our screens, patients will also be able to see areas being worked on and are able to gain a better understanding of dental procedures being performed.